Isn’t there something comforting about a dip? They are uniquely versatile, either being the focus of a solitary evening alone (you, the TV, a dip and dippers) or being classy dishes on a special buffet table (for dozens of well-dressed guests with differing tastes), and all events in between. There are few foods that can so successfully encompass the informal and the grand. The author, Peggy Fallon, has eight or so cookbooks to her credit and has contributed to dozens more as a recipe developer and tester. She has taught at various cooking schools and has run her own catering company. Peggy’s books have always been practical and attractive, and Great Party Dips is no exception. The photography by Alexandra Grablewski is scrumptious. 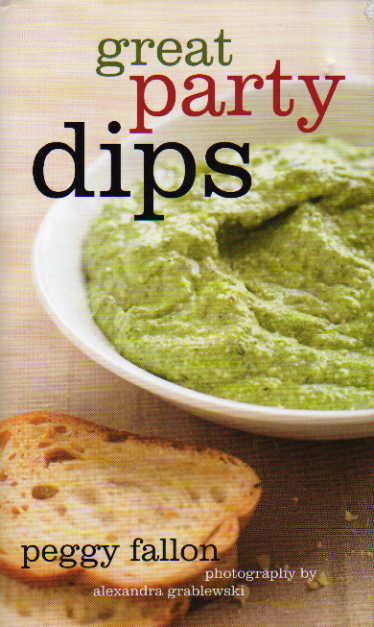 There are 60 dips listed here that cover the whole of dipdom and indeed dipperdom. Cool Dips and Spreads, Salsas and Such, Warm Dips and Spreads, and Dependable Dunkers are the chapter titles and those chapters offer far more than mayo with curry and ketchup and a dry cracker. Peggy has included some of the best classic dips like Potted Shrimp (OK, so I am British and bound to give this delight a plug), and Bagna Cauda (perhaps the most celebrated of Italian dips which always adds an air of sophistication to a gathering), but there is so much that is new and inventive. Chicken Liver Pate with Marsala and Capers is a great improvement on shop-bought pate. If you could find one of this quality in a fine deli then its price would give you a fit. It’s an Italian-inspired recipe and has the addition of anchovy paste. It makes all the difference to the recipe but does not impart any kind of fishy taste. It’s there for the rich salty tang and is an essential ingredient. Smoked salmon in any style is luxurious and Peggy has a Smoked Salmon Spread with Scotch Whisky. It couldn’t be easier to make, has few ingredients and you won’t have to buy the most expensive slices of salmon. A classy spread for a reasonable price. It’s not often that I prefer a contemporary recipe over the original, but Great Party Dips has Brie en Croute which is quite marvellous in its form and simplicity. Traditional Brie en Croute has pastry as the housing for the cheese but Peggy’s version uses a small hollowed loaf of bread, which is more practical and less of a fiddle than sheets of floppy pastry. Her garnishes of apricot jam and Amaretto or Brandy (I would go for Amaretto as it marries so well with apricots) elevate this into a real centre-piece. 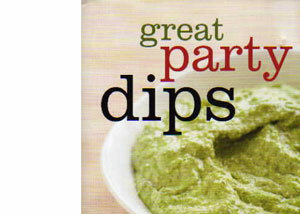 Great Party Dips is a book to buy and use. It has something for everyone and for every occasion. It’s a must for anyone who loves entertaining a crowd but needs to keep an eye on the pennies. The choice of dips and spreads runs from the rustic to the regal and from trendy to traditional. A real winner and great value for money.